Republicans say John Fetterman, Gov. Wolf's running mate, is an example of a Democratic "leftward lurch" that can help the GOP. A dozen weeks to Election Day. Time to test the waters. What's floating around out there? Dems overconfident? Republicans doomed? Do Democratic socialists give voters the heebie-jeebies? Can a rising youth vote sink the GOP? Dems are pretty much sold on a "blue wave" thanks to President Trump. Republicans argue that because of the economy, things, for them, are looking better. If Dems are right, it's easy reelection for Gov. Wolf and Sen. Casey, congressional pickups en route to control of the U.S. House, and erosion of GOP majorities in the legislature (though almost certainly not enough to flip either chamber). But if the "wave" just laps to the shore on Election Day? Different story. Either way, it's all about Trump. Morning Consult's key states "2018 Midterm Wave Watcher" released late last week shows Trump's approval numbers still down in Pennsylvania. And it shows the generic R/D ballot here favoring Democrats by five points (41-36). But state GOP Chairman Val DiGiorgio says that's only because, "In all midterm elections intensity is with the party out of power." He says 40 staffers surveying in every Pennsylvania county are finding "the trend is getting better" for the GOP. He credits tax cuts and Trump going to Korea, and notes the generic ballot earlier this year had Republicans down double digits. That's certainly true nationally. Real Clear Politics' average generic ballot had Dems up 12.5 points Jan. 1. The current RCP average has Dems up 3.9 points. "If we get our base out, we'll have a good year," DiGiorgio says. Could be. The Consult report says Trump's approval rating among Pennsylvania Republicans is 67 percent. Democratic consultant, strategist and former Democratic state party chairman T.J. Rooney calls the current five-point Democratic edge "definitely believable." He even concedes that without Trump dominating political news (not in positive ways) GOP chances would improve. "They [Republicans] have something to say," says Rooney, "but they get drowned out. Every day there's new fodder for the fire and it comes from the guy in charge." Ah, but you know how Democrats do. The party is known for internal divisions. Republicans think they'll benefit from that. "The leftward lurch," DiGiorgio calls it. He means Democratic socialists. There are four state House candidates endorsed by Democratic Socialists of America. And DiGiorgio calls Wolf's running mate, LG candidate John Fetterman, "a silver-spoon socialist." Fetterman is a Bernie Sanders fan. 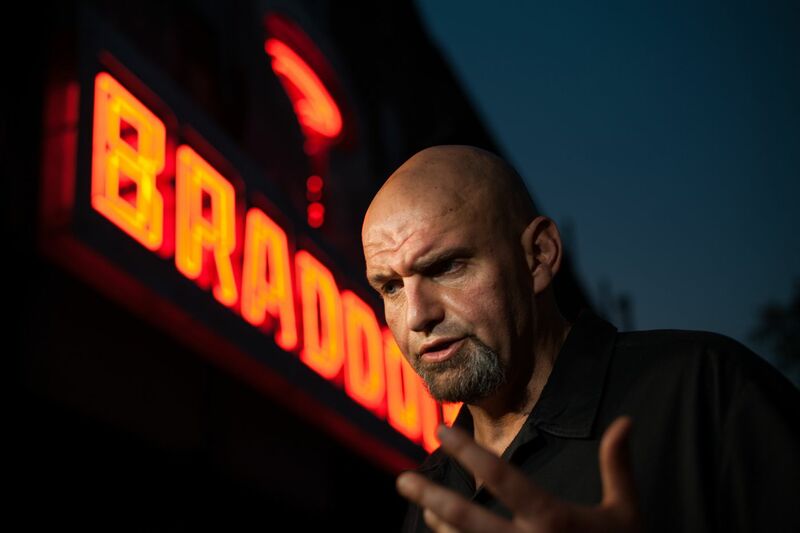 And as Braddock mayor, salary $150 a month, Fetterman has gotten support from his family, which owns a York insurance firm. I ask Fetterman if he'd care to respond to DiGiorgio. He offers a Wolf campaign-style reply: "Val, can you get Scott to finally release his tax return?" Still, Republicans see opportunity in painting Dems too left: free health care, free college, abolish ICE, end of capitalism and such. It's just hard to make a case that a few House members or a lieutenant governor can effectuate radical change. And Dems are buoyed by what they see as positive voting trends, and a large-scale effort to turn out younger voters. NextGen America, billionaire liberal activist Tom Steyer's PAC, is dropping $3.5 million in Pennsylvania to drive the often-idle youth vote. Starting this week, 130 paid staff members plus volunteers are on 70 college campuses across the state as students start to arrive for fall semester. "Welcome Week" is aimed at registering thousands of new voters. A NextGen spokesperson says overall efforts began last year, and Pennsylvania leads the nation with a 16 percent increase (just since February) in new registration of 18- to 29-year-olds. Also, Democrats say two voting trends here favor their candidates. Nathan Davidson, state House Democratic Campaign Committee director, says there's an uptick of 275,000, mostly Democratic, "surge voters," those who voted in 2017 (basically an off year, judicial and local) after not voting in prior elections. And he says Democratic turnout in six House special elections since 2016, four won by Democrats, outperformed the norm. "There's energy driving Democrats," Davidson says. DiGiorgio says, "To the extent there is one, it's regionalized [in the southeast]. I don't see it around the state." Maybe not. But right now, it's hard to see Wolf or Casey losing. And the question of the moment is should Republicans merely get out waders — or seriously think about lifeboats?